When we gain the little bundle of joy, we also gain some extra pounds. 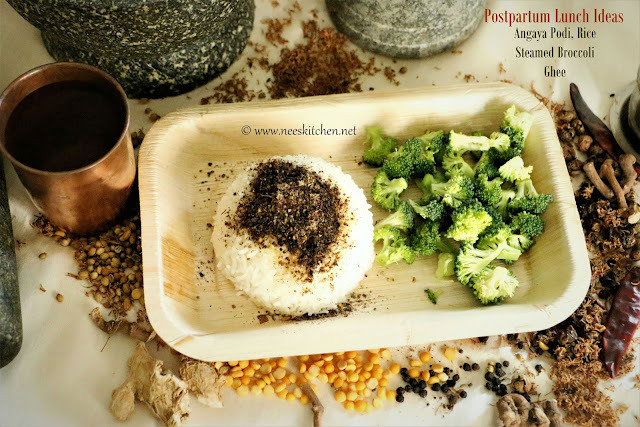 The recipe today I am posting is one such recipe which would gain weight due to its ghee content however it is one of healthy diet given in Tamilnadu to postpartum mother’s. It is truly curative and magical recipe of the past. This lunch spread has Angaya podi, Ghee, Rice & Steamed Broccoli. A balanced healthy diet is crucial for good health of new moms. I would like to introduce a book written by my cousin Lakshmy Ramanathan called ‘For Bumpier Times’ An Indian Mother's Guide to101 Pregnancy & Childcare Practices. Over to Lakshmy about the book. 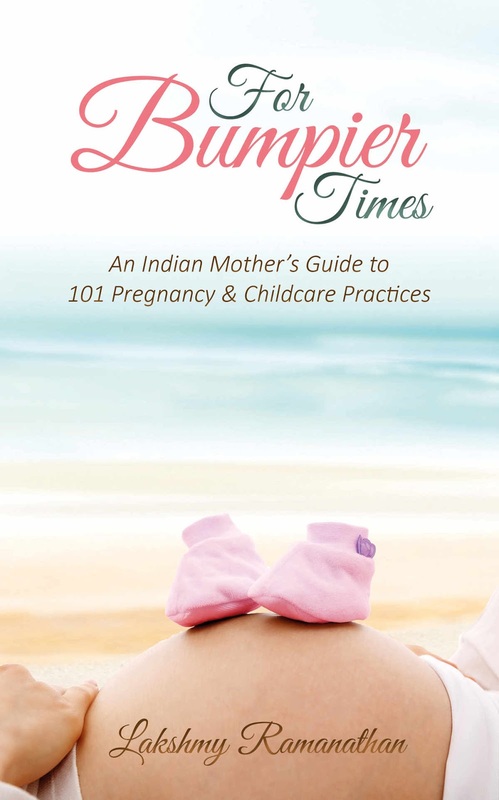 While I was writing ‘For Bumpier Times’, practices surrounding pregnancy, child birth & care were recorded from homes dotting India’s cities, villages, mountains and valleys. The most enjoyable and enriching bit was coming across the recipes that each household had tucked away in its kitchens, steeped in tradition and reflective of the land, produce and weather in that region. When I laid my hands on recipes for the pregnant woman, new mother and baby, I couldn’t help but marvel at the intrepid way in which our ancestors had combined taste with nutrition, culinary experiments with wisdom and meals from locally sourced products. For example, in the western and north western parts of the country, laddoos made from fenugreek seeds- scientifically proven to improve milk supply - were and are still given to a new mother. In general, intake of milk and dairy products are encouraged during pregnancy so that calcium reaches the growing baby. Post delivery, green vegetables and leaner meats that are easier to digest are preferred over roots and red meat . It appeared as if everything was curated and designed to accommodate the changes and demands made by the new mother and her baby. Despite the logic and wisdom however, traditions can prove over elaborate and obsolete over the years - something that both new and experienced mothers or other members of a house fear to examine and question. - Eat to your hunger. On an average, a pregnant woman needs between 300- 400 extra calories extra and a nursing mother 200- 500 calories over and above her normal diet. Broccoli is also a good source of folic acid, vitamin C, calcium. Ghee - no scientific research to suggest that ghee will help postpartum mother, however this has been given as a part of this meal. 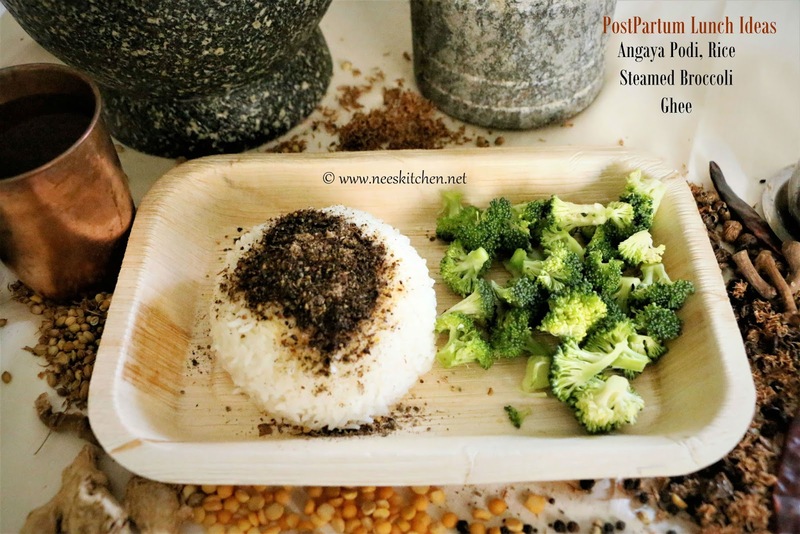 Angaya podi – I have listed out the benefits in the recipe. Refer to my post.